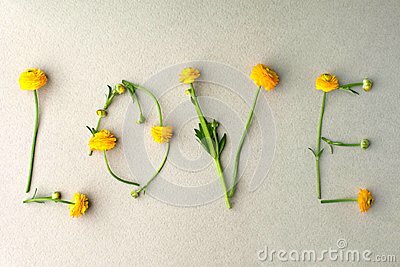 Word LOVE made of yellow flowers on green pastel background. Minimal love concept. Mothers day and Valentine`s Day Flat lay. Valentine`s day background with teddy bear and rose. Love seamless pattern. Disco night. Abstract background. Puple and yellow colors and love lettering. Paper boat with the word `love`.